Travis Browne was still on the mat at Scotiabank Centre in Halifax, Nova Scotia, on Sunday night, trying to clear the cobwebs. The man who put him there, Derrick Lewis, was on the mic searching for Browne’s famous girlfriend, former UFC women’s bantamweight champion Ronda Rousey. As Browne was still feeling the effects of his third straight loss and fourth in his past five fights, Lewis went straight for the jugular, as he referenced domestic violence allegations made against Browne in 2015 by Browne’s ex-wife, fitness model Jenna Webb. No charges were ever filed against Browne and an independent investigation commissioned by the UFC found “inconclusive evidence,” but Lewis brought it front-and-center before a national television audience. Even the fact that Yamasaki seemed to let the fight go on far longer than it should have didn’t seem to engender Browne all that much sympathy, with Lewis even thanking the official for the opportunity. After being dropped to the mat by a Lewis right which clipped his temple, Browne ate about a dozen uncontested punches, the last several few bouncing his head off the mat, before the bout was waved off at the 3:12 mark of the second round. Browne was taken directly to a local hospital for observation, so he wasn’t able to attend the post-fight news conference and defend himself against Lewis’ barbs. Sunday marked what will likely be remembered as the exclamation point on one of the swiftest and harshest downfalls for a heavyweight fighter who was once on the cusp of greatness. A mere three years ago, Browne was considered the model for the next generation of heavyweight mixed martial artists. The former basketball player from Hawaii was a mix of power, range and athleticism that would be tough to answer. Around this time in 2014, Browne was 16-1-1, represented by one of the world’s top gyms in Albuquerque’s JacksonWink, and on the brink of a title shot. Somewhere along the way, things went south. Browne lost a decision to Fabricio Werdum in the main event of an April 2014 UFC on FOX card in which the winner was slated to receive a title shot. He decided from Jackson’s heralded gym to Glendale Fighting Club in Southern California, which was put on the map by Rousey’s success. His decline wasn’t an instantaneous thing. He won two of his first three bouts with his new team, finishing both Brendan Schaub and Matt Mitrione. Somewhere along the way, he and Rousey became an item. But the Mitrione fight was also a foul-plagued affair, one that started raising questions of whether Browne’s skills were regressing. He had already faltered during his lone loss in that stretch, failing to finish a fight he should have won against ex-training partner Andrei Arlovski and getting starched in a spectacular knockout. He looked equally bad in a loss to Cain Velasquez, getting finished late in the first round of their UFC 200 fight. A rematch against Werdum at UFC 203 was another decision loss in which he looked worse than the first time around. Browne’s trainer, Edmond Tarverdyan, has come under relentless criticism for Rousey’s performances in her past two fights, in which she was knocked out by Holm and finished in less than a minute by Amanda Nunes. While Browne isn’t about to publicly throw his trainer under the bus, his training in the leadup to the Lewis fight spoke for itself. He worked out at the Black House camp in Gardena, Calif., home of Anderson Silva and Lyoto Machida, and while he insists he’s still in the GFC fold, Tarverdyan did not corner him for Sunday’s fight. In a way, it seems fitting Browne’s low point came against his fighting antithesis. Lewis, a Houston native, is a classic brawler who has defied expectation every step along the way. He’s been one of the UFC’s most active fighters, as Sunday’s bout was his eighth in just under 24 months. He’s won seven of those, six of them via knockout. Because Lewis has relied on his thunderous power, it’s been easy to dismiss his prospects, because it’s long been assumed that somewhere along the way, he’ll be usurped by a more well-rounded fighter. But you can’t teach heart. Lewis uses sheer willpower to keep winning bouts that on paper figure to be problematic. Sunday, Lewis got through a terrible first round in which Browne peppered him with brutal body kicks before turning things around in the second. UFC marketing types don’t seem to know what to make of Lewis, but there’s clearly something there. He delivers non-stop deadpan humor that frequently veers into the un-PC – indeed, he deflected questions about Browne’s body kicks by claiming he wasn’t hurt, he simply needed to defecate – which seems to make the company gun-shy on going all out on pushing someone with clear-cut star potential. But Lewis – who showed up at the press conference with a miniature replica UFC belt, claiming to be the interim heavyweight champion – doesn’t take himself too seriously, fights up to his competition and is honest with himself on where he needs to improve. Those are traits that endear fighters to fans. And ones from which Browne could learn. 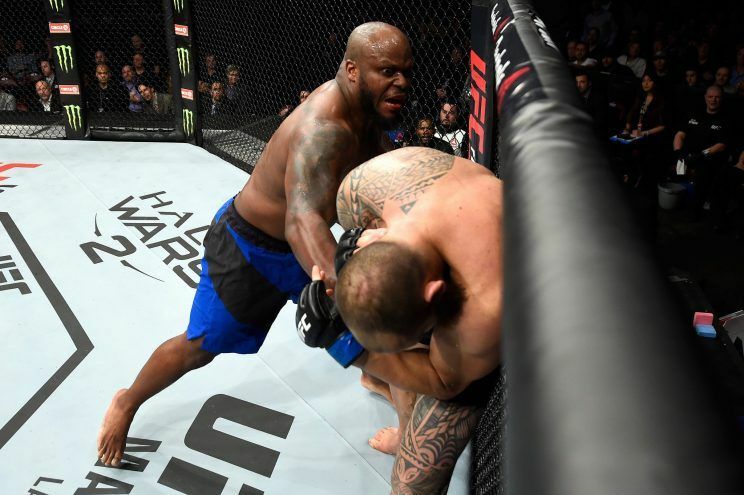 After Derrick Lewis knocked Browne out during the UFC Fight Night 105 main event, Lewis added insult to injury by bringing up past domestic-violence allegations against his fallen opponent, before calling out Rousey. We're not sure what's worse — Browne getting knocked out or Lewis's stinging words for him afterwards. Well, that KO was pretty mean. Aw man! Nothing left to see here, folks. 0 Response to "As Travis Browne's downward spiral continues, a new heavyweight contender emerges"